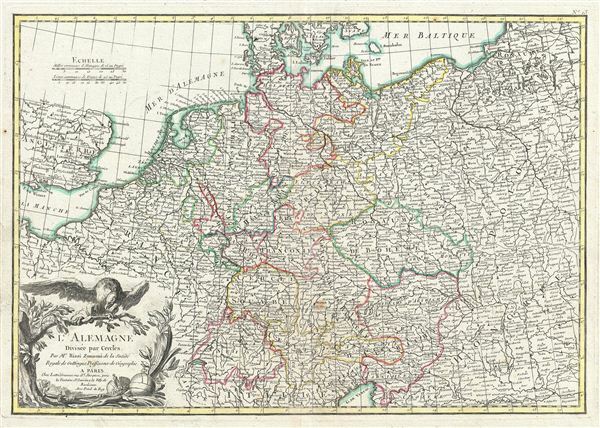 A beautiful 1783 example of Rizzi-Zannoni's decorative map of Germany. Rizzi-Zannoni's map covers from Jutland to the Gulf of Venice and from england to Poland. The map offers excellent detail throughout showing mountains, rivers, forests, national boundaries, regional boundaries, forts, and cities. A large decorative title cartouche depicting the Reichsadler (Imperial eagle) appears in the lower left quadrant. Drawn by Rizzi-Zannoni in 1783 for issue as plate no. 13 in Jean Lattre's 1783 edition of the Atlas Moderne. Very good condition. Original centerfold exhibits toning. Blank on verso. Platemark visible. Rumsey 2612.031. Phillips (Atlases) 664. National Maritime Museum, 215. Malinowski, H., The Malinowski collection of maps of Poland, 685 (1762 ed. ).